Integration of patient data into an electronic health record is a large undertaking. The VA has teamed up with Open mHealth to achieve the next step making patient data collected from mobile apps understood in a clinical meaningful way appropriate interventions by clinicians. 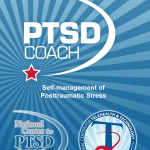 The PTSD Coach is being piloted currently to determine its applicability and effect on development for other apps currently being designed by the VA system.